This Watson Wednesday post is a bit different. A few years back, I had bought this book at a Shepherds Conference. I had just accepted the Gospel and had been interested in learning more about what expository preaching was. I picked up this book with the hopes that it would give me a solid definition of expository preaching. But I soon found out that it was a book about my favorite puritan and the illustrations that he used in his ministry. 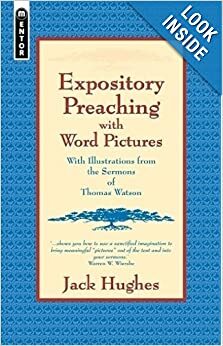 Dr. Jack Hughes takes the writings of the Puritan Thomas Watson and analyzes the many “word pictures” that he uses in his preaching in teaching. This book makes a good case for preachers to use illustrations consistently in their expository sermons. In the back of the book he even places a “gallery” of Thomas Watson quotes organized by topic, so that preachers have an archive of Watson statements at their finger tips. I recommend this to any preacher, pastor, and fan of Thomas Watson. For anyone who struggles in the area of illustrations, this is a must have. If you are a preacher, you need to illustrate. Even word pictures are worth a thousand words. They turn the ears to eyes and can evoke a good response from the people. Add color to your conversations, Gospel presentations, and your preaching with word pictures.